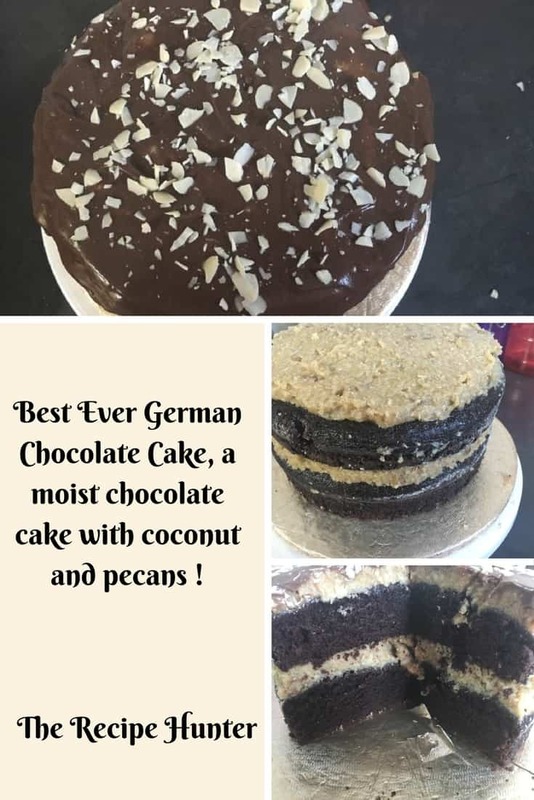 I didn’t even know such a cake was around until I watched Rev Run’s Sunday Suppers Show and saw the Episode Justine’s Jazzy Jumbo Gumbo making this cake for dessert. It looked so delicious and she made it seem so easy to make which I knew I just had to try it. 2 cups desiccated coconut, but if you love coconut you can use more. Prepare the chocolate cake and allow to cool. In a sauce pan, whisk together the eggs and the condensed milk. Add the margarine and cook over a medium heat until the mixture becomes thick. Stir it while it cooks, otherwise it will burn and stick to the bottom of the pot. Remove from the stove top and add the coconut, vanilla essence and pecan nuts. To put this cake together, place the first layer of the cake onto a plate. Evenly spread the filling over the layer. Place the second layer of cake on top of the filling. Spread the remaining filling over the top of the cake. Pour the ganache over the top , using an off set spatula, spread all over the top of the cake and allow some to drip over the sides. Sprinkled chopped up blanched almonds over the top. Awesome, thank you so much, hope this one will work for you. Pkease note, I have not made this one personally, its a FB member of my group that tried and tested it and her post and pics. This looks so yummy and indulgent! You can’t beat a delicious chocolate cake. Wow, this looks super yummy. Making me long for chocolate cake.